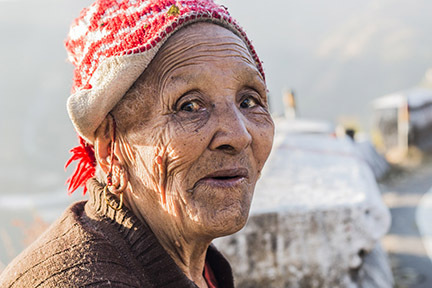 These pictures of senior citizens were chosen for three reasons. They all have natural lighting. They are all close up portraits. 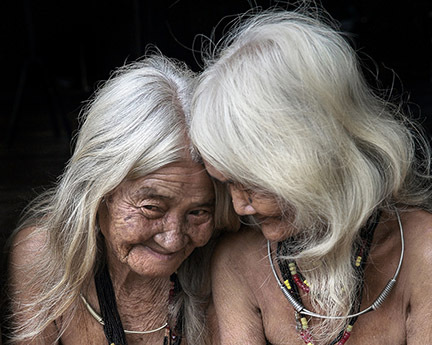 All of these photos of old people show unique and genuine emotions. 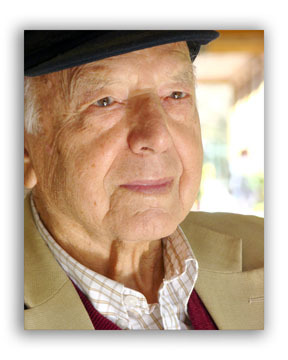 Using the existing natural light when it's available to take portraits of senior citizens. 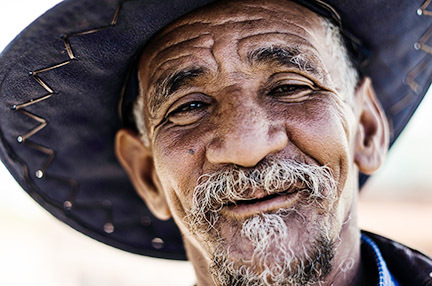 That makes a daytime portrait session good for two reasons. They'll be awake and the light will be right. Natural light is always the best lighting technique to use. You can capture spontaneous expressions when you only have to focus on your subject's emotions and you don't have to mess around with flood lights or strobes. Sometimes moving your subject closer to a natural light source is a simple task. Look for window lighting or a spot in the shade of an outdoor overhang. There are other times when you will have to create the the look of natural light by planning ahead. This can be done using one single external flash aimed sideways at a nearby wall or bounced off of a ceiling. 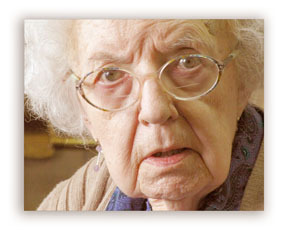 Senior citizens will feel more relaxed when there is no distraction from an artificial photo studio lighting. Watch the background for distracting colors or patterns. The bright blue structure behind this man's head is distracting. 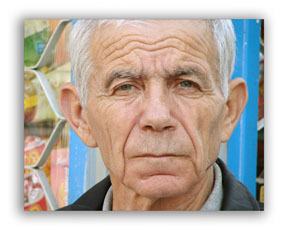 Here is the same photo of the same elderly man without the distracting bright blue. I did the retouching in Photoshop using layers and saturation. Notice how our eye is no longer distracted by the background. 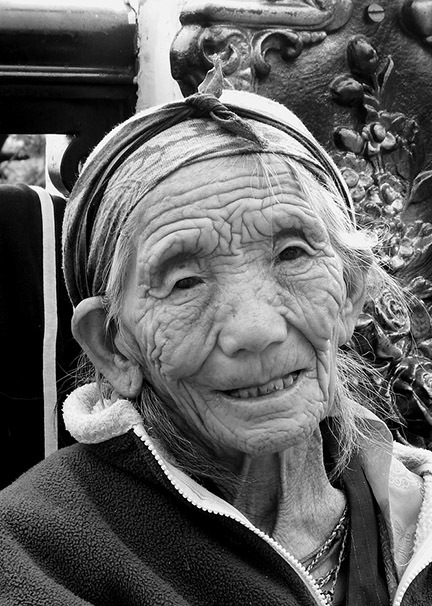 Taking pictures of the elderly is not something many photographers think about doing very often. 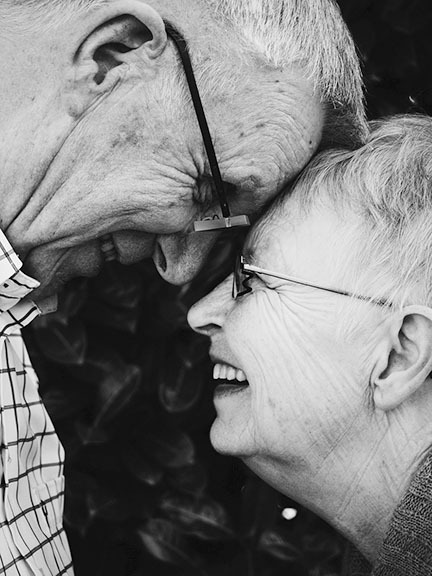 Forming relationships with senior citizens is a valuable experience. Digital Photography is a great tool for all of us to build a better understanding of our world. There is also the aspect of recording history to consider. When you use photography to capture a moment in time, you are recording an event. 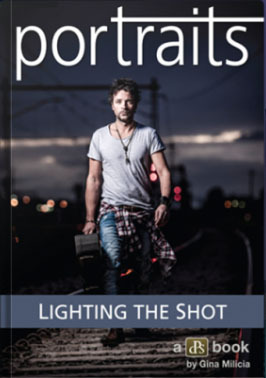 It may not make in into the history books, but you have an opportunity to easily share it with many people all over the world because of the magic of digital photography and the internet. Whether you are doing nature photography of landscapes, doing macro photography of insects and flowers or taking pictures of senior citizens, learning a few digital photo tips will make your pictures more effective at communicating an idea. Please take at advantage of all the photography tips on this web site. You can also share the techniques by using one of the social bookmarking links below. Photograph senior citizens doing an activity. 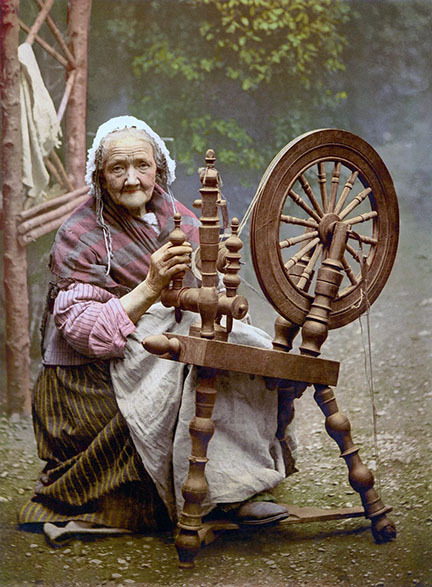 This photo of an old woman working at an antique spinning wheel sets the image up with an historical atmosphere. 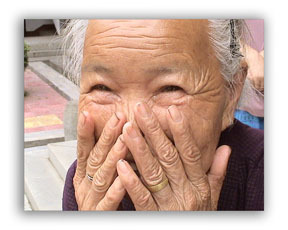 It's a story telling pose, showing an elderly woman actively participating in something. The location is simple, but appropriate for the subject matter. Rather than a posed portrait, wait for the right moment. When there's activity that shows a part of the work they're doing, make your exposure then. 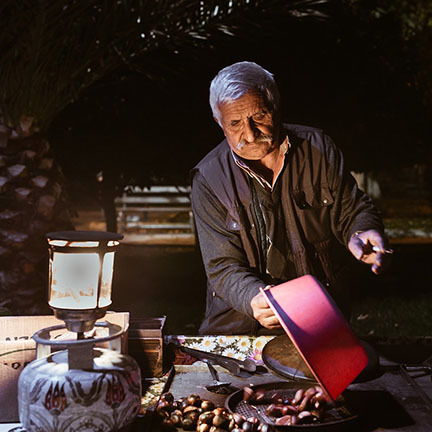 This old man is is roasting some food for sale ar night. His single lantern does a nice job of lighting his face and revealing his features. Photos of Old People. 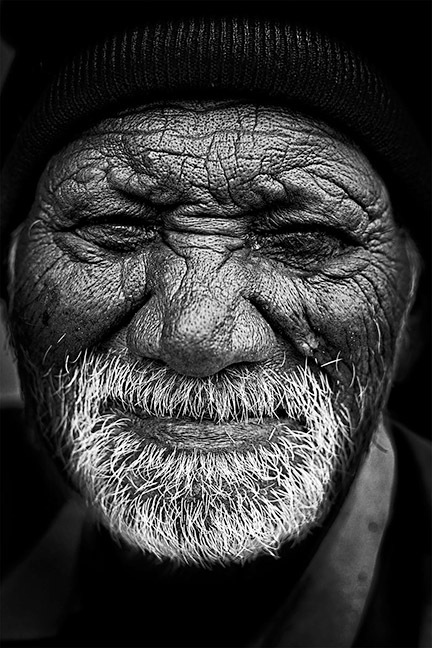 More thoughts on photography of the elderly and a few more sample photos of old people. 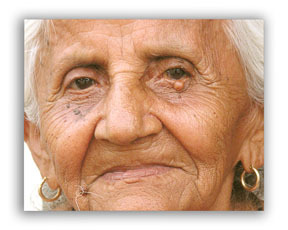 Pictures of the Elderly. Comparison of the difference between color and black-white photography portraits of old people. There is also an opportunity for you to share your own photography with other readers. 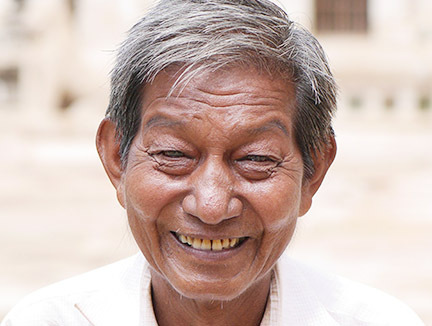 Shutterstock.com You can search for more images of senior citizens, the elderly and old people photos from a huge database of pictures.